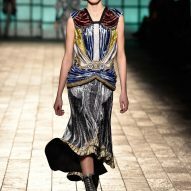 Fashion designer Mary Katrantzou has created a series of dresses, jackets and other garments that juxtapose visuals from the modernist Bauhaus movement with those from the decorative Victorian era. 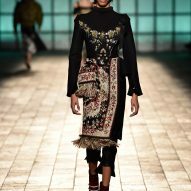 The Interior Lives collection was created for the Autumn Winter 2018 season, and debuted during a catwalk show in February for London Fashion Week. It includes references to graphics from the Bauhaus school – which celebrates its 100th anniversary of founding next year – alongside earlier decorative works, particularly from the Arts and Crafts movement, and 19th-century British designer William Morris. 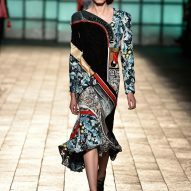 The stark contrast between the bold modernist graphics and delicate decorative prints is a focal point of the collection, which Katrantzou links through repeated geometric patterns and colours including black, cream, gold and pastel hues. 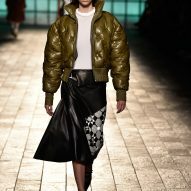 "The collection explores an intermingling of two different breeds of aesthetic, using their components to discover a new hybrid," said a statement from the designer. A set of posters for the 1923 Bauhaus Exhibition in Weimar, Germany, informed the first outfits in the collection. 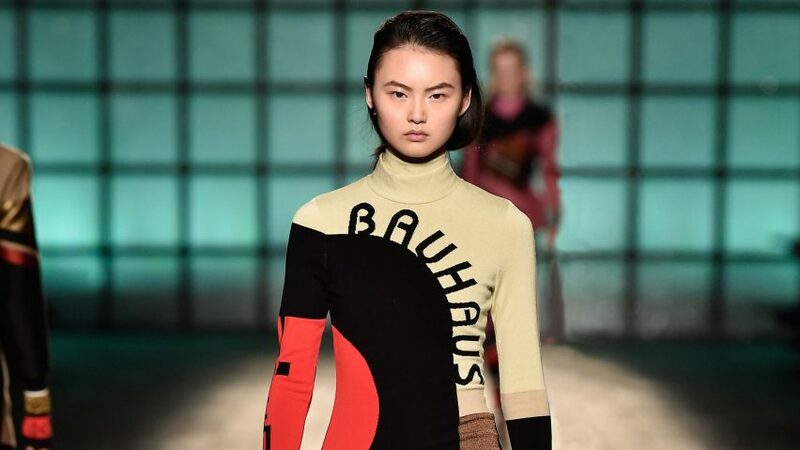 A long knitted dressed with "Bauhaus" written across the front helped lead the show, followed by a pink ensemble printed with "Weimar" and "Dessau" – the design school's two locations. 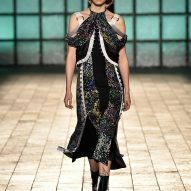 "It was about creating our own assemblage of all the different Bauhaus posters, and turning it on its head," Katrantzou told Dezeen. 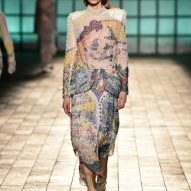 Katrantzou combines modernist shapes and Victorian-era florals to highlight the historical closeness of the design movements – despite their aesthetic differences – as well as their shared ideals of craftsmanship. 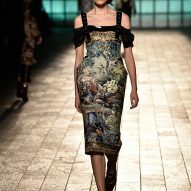 "I don't think anyone would put the Arts and Crafts movement and the Bauhaus together conceptually, but I think it was the beginning of modernism, even if aesthetically it is not as visible," Katrantzou said. "The roots of modernism lie, conversely, in the Victorian age, when practitioners such as William Morris began to approach aesthetics with an all-encompassing ideology that the Bauhaus would dub Gesamtkunstwerk – a total work of art," she said. "Here, all arts, fine and applied, would eventually be brought together." 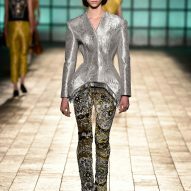 Silhouettes draw on 1920s fashion, with drop waists and high collars, as well as more hourglass, tight-waisted forms from the 19th century. 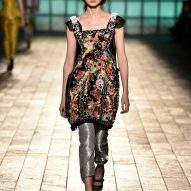 Dresses with ruffled bottoms have floral prints, cinched waists and complex prints, juxtaposing various design movements in single garments or full looks. 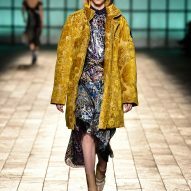 "Cross-breeding the extravagance of Victoriana with the utility of the Bauhaus, trouser suits are created in wallpaper-inspired damasks in stately home shades of periwinkle, rosé, gilt and sterling," Katrantzou said. 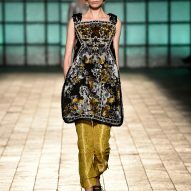 The collection also references designer William Morris' work, using his detailed floral drawings and references to symmetry and nature. These are reinterpreted in the primary colours commonly associated with the Bauhaus. 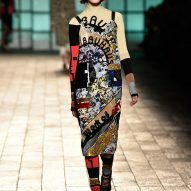 "We wanted to choose some of the colours that are present in William Morris' work and the Arts and Crafts movement, and bring them into the Bauhaus posters, and vice versa," said Katrantzou. "I always loved the Bauhaus posters for their symbolic nature, and equally, I think William Morris as a visual language is equally distinctive." 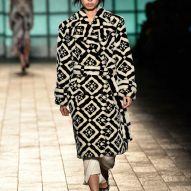 Geometric prints evoke the tiles of a hallway in an 1880s Victorian home, and are translated into leather, knit and faux-fur pieces. These in turn reference the Bauhaus aesthetic and the architectural geometries found across the school's iconic buildings – like in its gridded windows and split stairway. 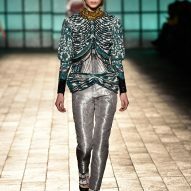 More structural pieces include metallic bulbous tops, with outlines akin to Victorian lampshades, and crinoline hip designs. 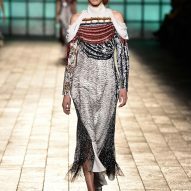 "There's something quite 'Bauhaus' about that, even if not conceptually, but for the purity and geometry of line," said Katrantzou. 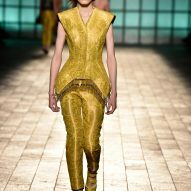 She sees a relationship between the craftsmanship and the importance of simple forms that both movements championed. Katranzou uses the two movements as bookends because of their stark differences. 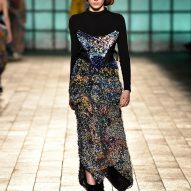 The utilitarian and practical theories taught at the Bauhaus contrast with the ornate and decorative aspects of the Victorian era, but Katrantzou offers Morris' designs as a visual connection. 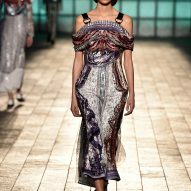 "From a creative point of view, it is nice to have that depth of references that you feel you're satisfying your inquisitive nature while designing," Katrantzou said. 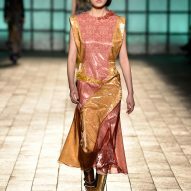 The fashion designer was born in Greece, and studied at Rhode Island School of Design and Central Saint Martins before setting up her studio in London in 2008. 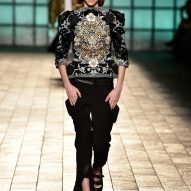 Her previous collections have also drawn of influences from modernism, and architecture more generally. 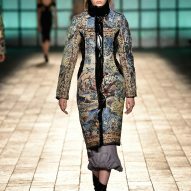 For Autumn Winter 2015, Katrantzou showed garments with modernist shapes contrasted with "horror vacui" details, while her Autumn Winter 2013 collection featured motifs including bridge trusses and streetscapes. The Bauhaus was founded in 1919 by German architect Walter Gropius in Weimar, as a school for a "total" arts education. Areas of study included graphic design, furniture, textiles and industrial design, although but the school didn't run a specific architecture programme. In 1925, the Bauhaus moved to a now-iconic International Style building designed by Gropius in Dessau, where a museum about the school is planned. It then relocated to Berlin for its final year, before closing in 1933 in the wake of the rising Nazi regime. The term Bauhaus has become synonymous with modern design and architecture, as many renowned modernist architects and artists studied or taught at the school themselves, before moving to practice in various cities around the world.